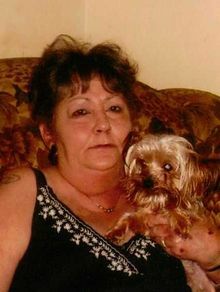 Lilly Jeanette Payne Dardenne, 59 of Miami, passed away on Friday, April 8, 2011 . She was born January 26, 1952 in Hobart, Oklahoma to Doris D. and Willie Jewel (Favors) Payne. She had lived in Picher all her life until the tornado completely destroyed her home. Mrs. Dardenne worked as an aid at the Picher Nursing Home. She was a member of the Fellowship Baptist Church in Baxter Springs, Kansas. She married James Dardenne in 1978 he preceded her in death in 1984. She is also preceded in death by her parents, 4 brothers: Virgil, Charles Darrell and Jerry Payne. Survivors include: mother: Willie Jewel Payne of Miami, OK, one son: Gary Wayne, Jr. and wife Violet Ross, Toney, Al. One brother: David and Wife Alice Payne of Miami, OK. 5 sisters: Wanda and Richard Barr, Baxter Springs, KS, Darlene Desilva of Miami, Pat and husband Roy Rutherford of Miami, Debra Crumrine and Mickie Jo Bogle of Chetopa, KS. 1 grandson and 2 step grand-daughters, several nieces and nephews. Graveside services will be held 2:00 pm, Thursday, April 14, 2011 at the G.A.R. Cemetery with Rev. Jim Bowles officiating. Interment will follow under the direction of the Paul Thomas Funeral Home of Miami. Pallbearers will be David Payne, Dewayne Payne, Curtis Payne, Jason Payne, Rocky Payne and Terry Desilva, Jr. Honorary Pallbearers will be Tommy DeSilva, Dakota Payne, Tim Rutherford, Darrell Rutherford, Bobby Barr and Mike Barr.